The digital media wave is upon you. We catch the wave for you and help you navigate it. 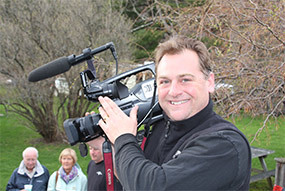 Stowe Media Group specializes in all of your marketing and video production needs for business and personal reasons. We promise honesty, integrity and loyalty as we listen to you in a free initial consultation, and then help coach you through your options to tell your story and grow your brand, sales and audience. The hard fact is that people are doing business on their phones and reading text is becoming a burden. That is the nature of our changing society and habits. We use our experience in old media and new media to help you find the voice you need to get the image you want out there. There is no subject we can’t illuminate for you through print, video, social media and all marketing platforms. It’s your vision, we direct you to it. WE ARE DIFFERENT than the others because we specialize in doing real life or, "cinema verite'. We will direct you toward what you want while using the resources available to us without wasting time and money. Call Director Heath Eiden now to set up a time to chat. It’s that simple.